We’d love your help. Let us know what’s wrong with this preview of Boom Bah! by Phil Cummings. "Shhh! Listen! Whats that sound? It starts with a Ting! When a tiny mouse taps a cup with a spoon. And ends with a triumphant Tah-dah!, as one by one, all the other animals join in. Ting! Tong! Clickety-click! Follow the band and tap your toe! Boom Bah! Here we go! To ask other readers questions about Boom Bah!, please sign up. Be the first to ask a question about Boom Bah! Break out the noise makers, drums, and kazoos and start your own band after you share this one. It all starts with a mouse tinging a spoon against a teacup. Then the cat gets involved by banging a spoon on a can. Pig grabs two pot lids to bash together as cymbals. And soon a line of animals are marching and dancing to the beat. What could that be coming over the hill? A real marching band with real drums, a tuba, trombones and more. Everyone starts to play music together with a happy “Hey ho!” A Break out the noise makers, drums, and kazoos and start your own band after you share this one. It all starts with a mouse tinging a spoon against a teacup. Then the cat gets involved by banging a spoon on a can. Pig grabs two pot lids to bash together as cymbals. And soon a line of animals are marching and dancing to the beat. What could that be coming over the hill? A real marching band with real drums, a tuba, trombones and more. Everyone starts to play music together with a happy “Hey ho!” A jolly book filled with rhythm, music and merriment, this is a winner of a book for toddlers. Cummings text is kept to a minimum, just carrying the noises and the beat along with it. The words are simple and great fun to read aloud because they are so jaunty. Rycroft’s art is silly and warm toned. I love that she included diving insects on most of the pages. If you look closely you can even see beetles in the grass who also get caught up in the music. Her attention to the small but delightful details is clever and adds to the fun. Highly recommended when you want a story time about music and you don’t mind the kids getting loud with their own marching band. Appropriate for very small children through preschool, this book will work for ages 1-4. A fun introduction to both kitchen pot clanging and musical sounds. Since it's geared for young ones, I appreciate how they used farm animals, something tots can identify with. **Like my reviews? I also have hundreds of detailed reports that I offer too. These reports give a complete break-down of everything in the book, so you'll know just how clean it is or isn't. I also have Clean Guides (downloadable PDFs) which enable you to clean up your book before reading it! Visit my website: A fun introduction to both kitchen pot clanging and musical sounds. Since it's geared for young ones, I appreciate how they used farm animals, something tots can identify with. Music and animals together! This would be great and could be interactive if you had some of the items mentioned in the story - cans, bowls, spoons, etc. A good companion to Moo, Baa, La La La!. This was ok. The illustrations are charming and the rhyme and pattern are fun. This is a noisy, happy book with lively illustrations and a touch of rhythm. The "babies" at work really enjoy it. You could use it as a spring board even with older children for a percussion music activity. 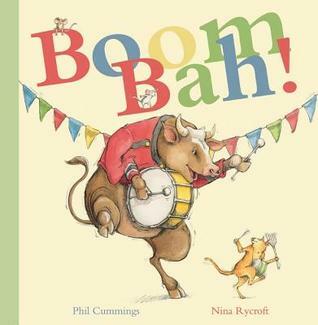 There are plenty of noisy, happy books out there that introduce the fun of onomatopoeia but they are enjoyable and this is a very nice one. It's also by a South Aussie which makes it even better. I used this book for Baby and Toddler storytime and the kids were huge fans. Whenever there was a sound in the story, I used my tambourine instead of saying the word for the sound and would make the tambourine play louder or faster depending upon the word. The kids LOVED this. Definitely one of their recent favorites. Delightful read aloud book for young toddlers showing the gradual growth of a group of animals marching and making music with simple kitchen utensils and eventually joining up with a real marching music band. After a tiny mouse taps a cup with a spoon and creates a noise, everyone wants to join in. Follow the band as it gathers and grows from a solo perfomance to an explosive, full-scale orchestra. Great rhythm, musical, good large illustrations. 3.5. The words and bright pictures made it exciting! good book to learn words with using songs. Its starts from a little noise then, becomes a party of songs and sounds. Follow a band of animals as it gathers and grows from a solo performance to a full orchestra. Onomatopoeia, rhymes and engaging illustrations will interest primary readers. A lovely one to use with younger children - toddlers. Would be great followed by your own version of a kitchen band or the drumming song. Cute illustrations. Not much to the story. It is mostly sound effects. since written over sixty books for children.